I slept in your bed last night because you woke up with a fever, complaining that your head hurt. I had hoped you would go back to sleep quickly, but once I gave you a dose of pain reliever, you wouldn’t stop talking and asking me for water every 5 minutes, so I settled in for the rest of the night. This morning, I watch you sleep. I just read a mom’s blog story about her baby dying at 2 months from SIDS. I gaze at the long eyelashes over your closed lids and thank God for this one, you, and for babies that live and keep mommas going. You roll over and settle into your pillow. I watch your eyebrows raise and lower again and I’m reminded of you as a baby. You’ve been doing this eyebrow raise since you were just a few months old. An outward display of your innate curiosity. When you first discovered something new…a toy, your foot, the ceiling fan…you would study it for what seemed like hours and your eyebrows jumped up and down. I silently wonder if you will always do this and if I will be able to catch your adult eyebrows raising and be taken back again to your baby days. You are slow to wake up and be fit to interact with the world…just like your parents. I swear, if I knew that coffee would solve the problem, I would very seriously consider having a cup waiting for you in the morning. Since we’re all a bit foggy, mornings are usually pretty slow around here. Coffee or juice, TV, morning news, feed the pets, tiptoe through our interactions. It’s hard to know what kind of mood you will be in and even if you wake up sunshiney, that can turn around on a dime. Your dad is the master of unintentionally “poking the bear,” as I like to call it. Sometimes all it takes is too much of a smile or an enthusiastic “good morning!” to piss you off. Somehow, though, we manage to muddle through. Just a few short months ago, every trip out the door was a struggle. These days, we’re more like partners. And off we go. Amazing how we suddenly find ourselves here and I have no idea how we got here…working together and being on the same page once in awhile. Not always. But now. Most days, you are attached to my hip. It’s a little frustrating at times. I want you to be independent, play on your own, and be able to entertain yourself. But, I also love that you need me and I know that this time is fleeting. One day soon, you will stop wrapping your little arms around my legs as I try to make dinner. You won’t ask to be held the instant I open my laptop computer. You won’t request bedtime stories and those off-tune lullabies you have been hearing since you were a baby. I won’t always see this sweet little face looking up at me. No two days are alike around here. I guess we’re not a family of routines. Certain times of the day are pretty routine…mealtime and bedtime mostly…but the rest of the day is open for anything. We make trips to the library and local parks. We have shopping days when we drive out to the Amish produce and discount stores and then stop at the big stores for anything else we didn’t find. In the winter, we stopped at McDonald’s a lot so that you could let out some energy in the Playland area, but summer means trips to the coffee shop for ice cream or bubble tea. On days when your dad is off work, we make bigger outings, like to the beach at Bald Eagle State Park or we drive to State College. You love to go to Barnes and Noble. We make trips to the strawberry fields, pumpkin patch and the county fair every year. 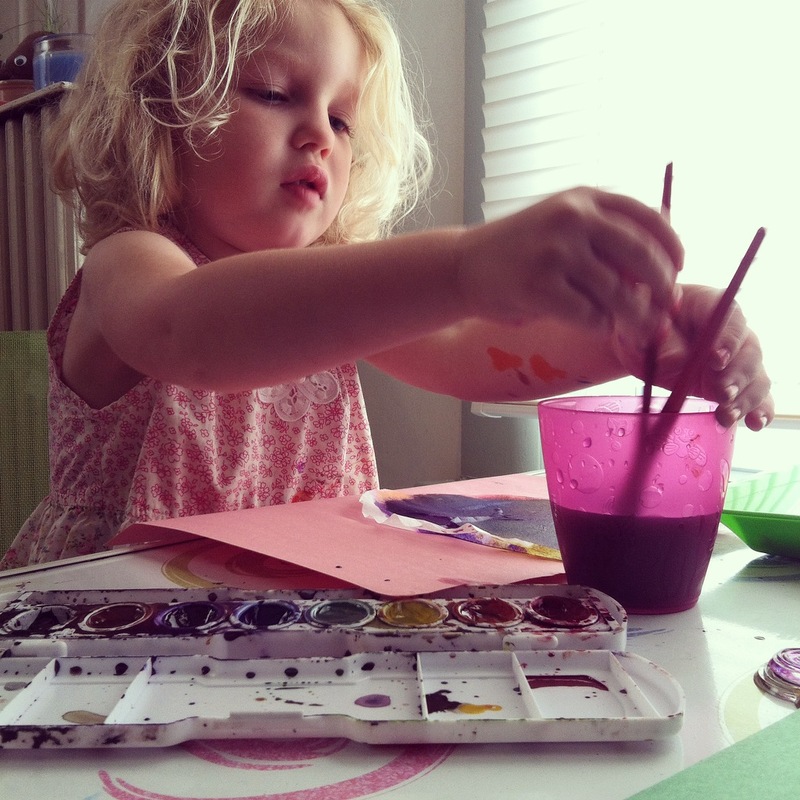 You like to spend a lot of time at your art table, using your watercolors and playdough. Sometimes you help me in the kitchen with whatever I am cooking that day. You follow me everywhere….literally. Even if I tell you to stay put because I have to run to the basement to pull something out of the freezer (a 30 second task), you have to follow me down there, making the process take much longer. We talk about privacy and how people need that when they go to the bathroom, so you follow me in there and tell me that you’ve closed the door so that I could have some privacy. Some days we spend way too much time watching TV. Some days feel like they will never end, but the weeks seem to fly by in a flash. I usually have to dodge a trail of toys that magically appear in the kitchen when I am trying to prepare dinner. At least once a week, you tell me you don’t like my food. We almost always sit down to eat as a family. You have become an old pro at saying grace and as we eat we share our favorite parts of the day, as well as our less stellar moments. More often than not, you barely touch your food and then 10 minutes after dinner you are asking for fruit or gummies. Bedtime is our time. Your dad takes turns with me and he tucks you in at night too, but more often it’s me. I still sit with you every night until you fall asleep and, though there are times when I think it would be nice to just plant a kiss on your forehead and leave you to fall asleep on your own, I still really enjoy just sitting with you because that’s when we talk. Ever since you were about 18 months old, we have been having conversations at bedtime. I used to be able to rock you in the chair and you’d lie in my arms and look up at me and tell me about your day, 2-3 words at a time. Now, you lie in your big girl bed and tell me how much you want to see penguins and that you want to go to the ocean. You ask questions and every response that I give you prompts another question. Not topic is off limits. I like to tell you the truth about whatever you ask. Pretty soon, I can hear you lightly snoring and I know that you will be out until morning (at least most of the time). This is the moment when I pause, watch you sleeping, if only for a few seconds. No matter how different you seem from the baby you were, this is the time when that little baby reappears and I thank God for the seconds, minutes, hours we have had together. When you’re finally in a deep slumber, I back out of your room and take one last glance at those long lashes covering your eyes, grateful that I don’t have to be quite so careful with the rattling of the door knob. I'm a working mom with an awesome partner-in-crime and together we're raising our little girl, while navigating life's little bumps and back roads.